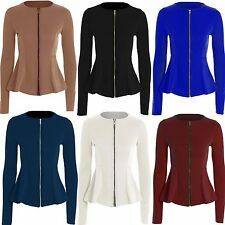 Ted Baker 'Bracti' Wool Peplum Coat BNWT. Super versatile and can easily be dressed up or down. Ted Baker style 'BRACTI'. Labelled Ted Baker size 0. (about equivalent to size UK 6 / EU 34 / US 2 per the TB size chart (see photo)). Ted Baker style 'LYNDSAY'. 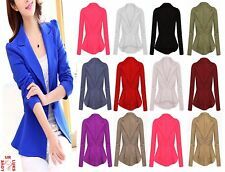 Ted Baker 'Lyndsay' High Collar Jacket BNWT. Labelled Ted Baker size 3. Ted Baker 'Sollel' Peplum Detail Short Coat. Super versatile and can easily be dressed up or down. Ted Baker style 'SOLLEL'. Becoming increasingly rare to find in this colour, and even more so in pristine unworn condition!
" BRACTI PEPLUM JACKET COAT". ORIGINAL RRP £249.00. AUSTRALIAN ORIGINAL RRP £549.00. RRP £249.00. TED BAKER 0. ELEGANT LONG SLEEVE WITH CONCEALED TED BAKER ENGRAVED BUTTON FASTENING. QUALITY CUT AND FIT YOU CAN EXPECT FROM TED BAKER LONDON. Chic Blush Pink Ruffle/Frill Faux Leather Cropped jacket. Armpit to Armpit 19" Length 19" Sleeve 19" all approx. SIZE Large. In Excellent Condition. Marella peplum jacket. Black with white detail.